The official start to the academic year, the annual Founders’ Day Convocation includes the recitation of the Declaration of Geneva and the handing out of white coats to the incoming class. To hone critical thinking and investigational skills, rising second-year students conduct research projects over the summer as part of the new curriculum. Two students share their work in basic science. A graduate of Northwestern’s Honors Program in Medical Education, Rear Admiral Boris Lushniak, MD ’83, MPH, became acting surgeon general of the United States on July 17. Program will integrate training in mental healthcare for LGBT clients with rotations in an infectious disease clinic and more. 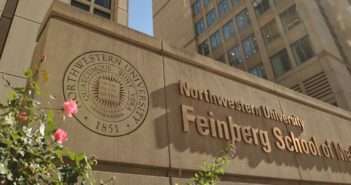 Five Northwestern University Feinberg School of Medicine faculty members were accepted into the 2013-14 Searle Fellows Program, a year-long faculty development program. Graduates of the sixth class of the Master of Science in Healthcare Quality and Patient Safety program and the third class of the Master of Science in Health Services and Outcomes Research program were recognized at the Center for Education in Health Sciences 2013 Convocation on June 29. The 161 members of the Class of 2013 celebrated their commencement ceremony with friends, family, and faculty at Chicago’s Navy Pier Grand Ballroom on May 23. As part of nationwide Match Day, members of the Feinberg Class of 2013 came together on Friday, March 15, to find out where they will head for residency after graduation. The Class of 2012 earned their long white coats at the 153rd graduation on May 24. Excited to embark on their new journey as doctors, students gathered with faculty, friends, and family for the commencement ceremony at Chicago’s Navy Pier Grand Ballroom. 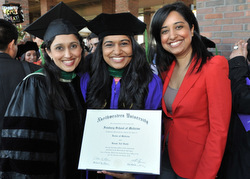 On the second Saturday in May, members of the inaugural class of Northwestern University Feinberg School of Medicine’s Physician Assistant program became its first graduates.